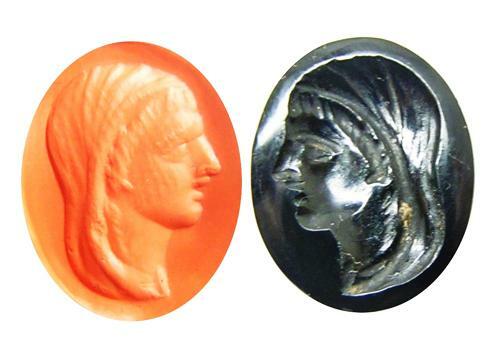 This is a nice ancient Roman portrait intaglio, dating to the 1st - 2nd century A.D. It is cut on a jet black onyx with a veiled head. This gem would have originally been set into a gold or silver signet ring, used to seal and authenticate letters and transaction. Today this ancient gem has survived down to us in perfect condition, suitable for remounting into a gold signet ring today. PROVENANCE: Ex.Property of a London Gentleman; acquired by his father in the 1970s; thence by descent.